Written by: Arthur Marx. Directed by: Charles Barton. 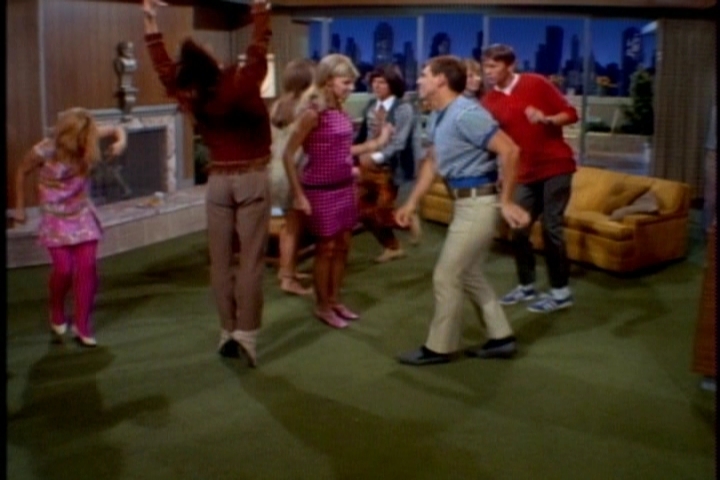 As we open, Bill is getting cozy with his latest squeeze in the Davis living room, when Cissy’s date for the evening shows up. 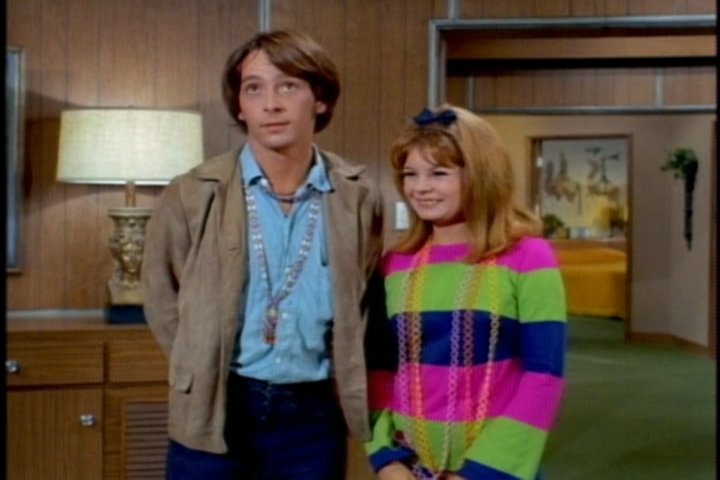 The boy’s appearance startles Bill, who is even more surprised to see what Cissy is wearing. Personally, I think she looks cute–like a Twist n Turn Barbie. Bill, however, has a different reaction. Coming home from work the next day, Bill confronts another parenting challenge. It seems the twins have been leaving their toys strewn about the house. Like Jody’s skateboard, for instance. Bill decides to institute a system he encountered in the Army–the “slob box.” Toys that aren’t put away will be confiscated, put in a box, and donated to charity. Meanwhile, Bill shows Cissy a magazine picture of his girlfriend, a top model, and talks obliquely about the Japanese principle of shibui, or simple elegance. After staring at the magazine picture for a while, though, she seems to get the point. Uncle Bill wants her to dress more like a middle-aged woman! 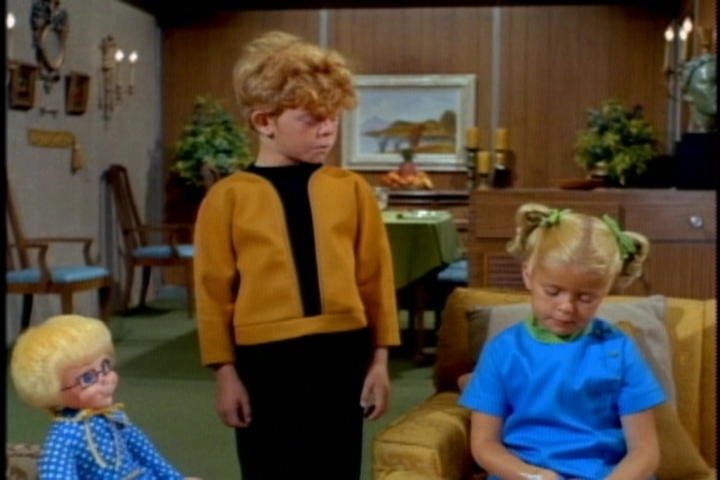 Taken aback, Bill is curt to the point of rudeness with Cissy’s friends. I’m not sure why he’s so upset about Cissy’s dress. It’s the boys’ outfits that are truly disturbing. 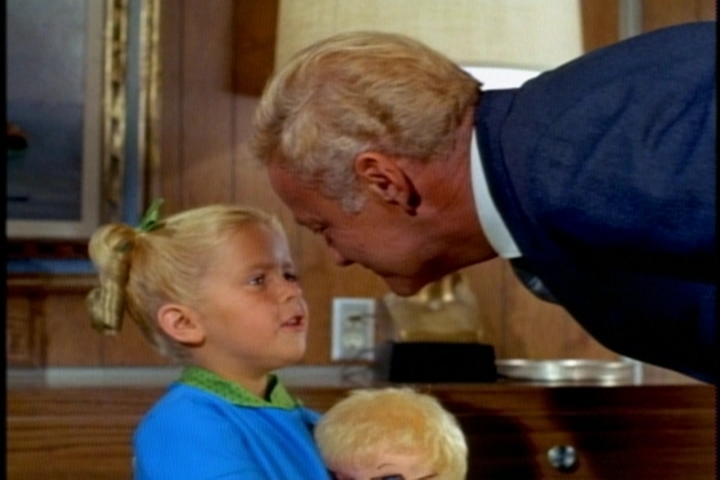 After her friends leave, Cissy calls Uncle Bill out for judging them unfairly. He does make Cissy to wear non-mod clothes every now and then, though. Meanwhile, the twins have lost so many toys to the box that they’re actually turning to books for entertainment. Well, at least Buffy still has Mrs. Beasley. The next day, she is having a bridge party with her doll, when French calls the kids to wash up for dinner. 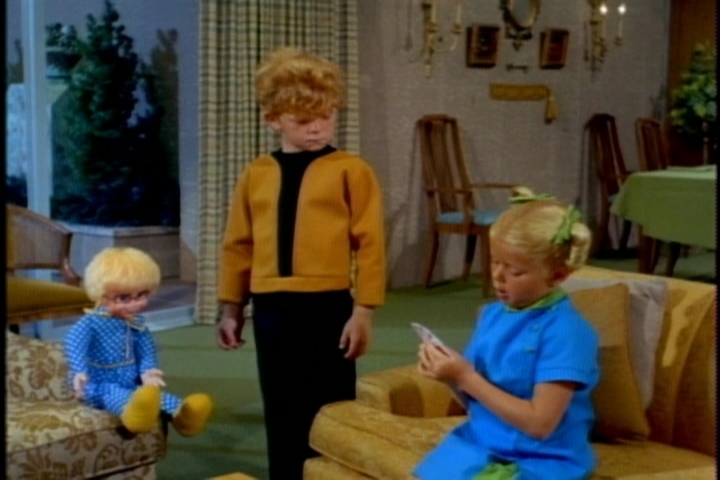 As they scramble, the twins accidentally brush against Mrs. Beasley. 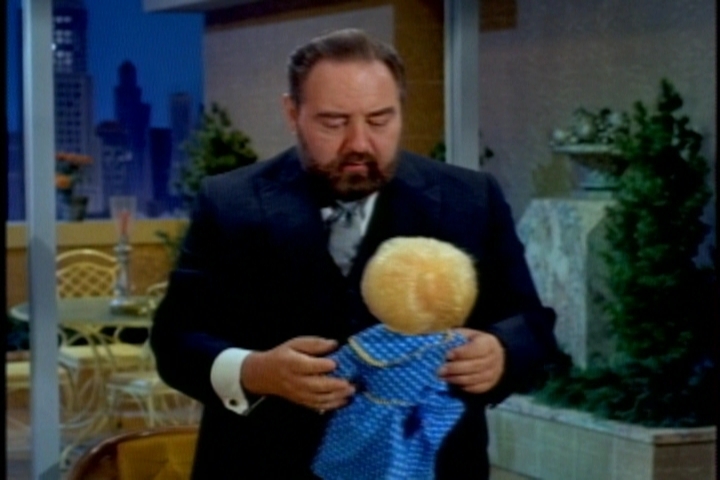 When French finds the doll on the floor, he appreciates enormity of this moment. To his credit, his first instinct is to sneak the doll back onto the chair, but he’s interrupted by Bill and the kids entering the room. 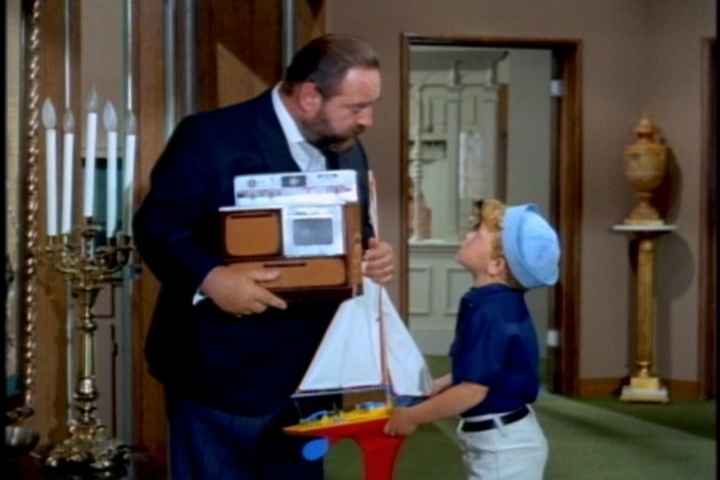 It’s all up to Bill now–is Mrs. Beasley a goner? To Buffy’s relief, Bill decides that the toy box has outlived its usefulness. 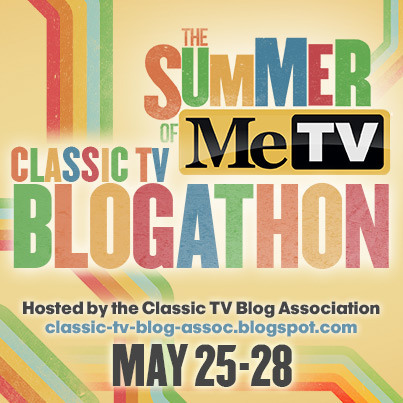 This is a rather slight episode, but the mod scenes make it entertaining. Joan Wilson: Cay Forester. Ronny: Dennis Olivieri. 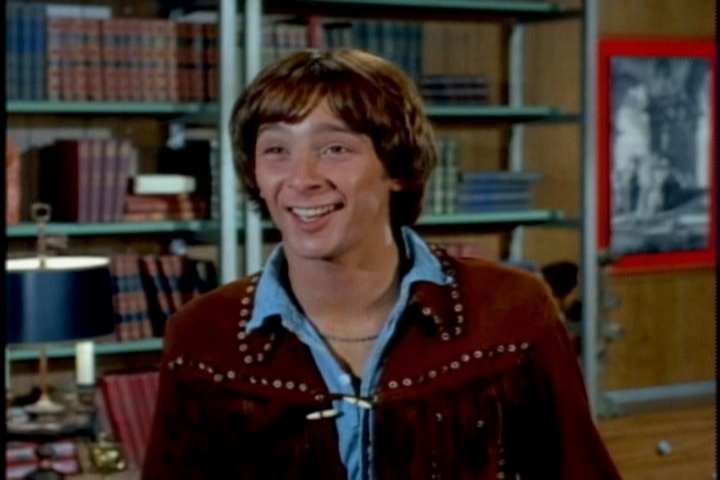 Dennis Olivieri worked steadily throughout the sixties on television, sometimes under the name Dennis Joel. 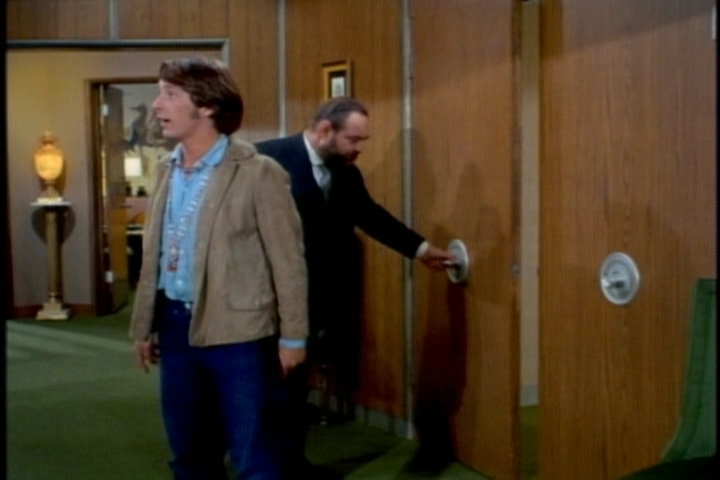 He had a regular role on an interesting-sounding 1969 series called The New People. 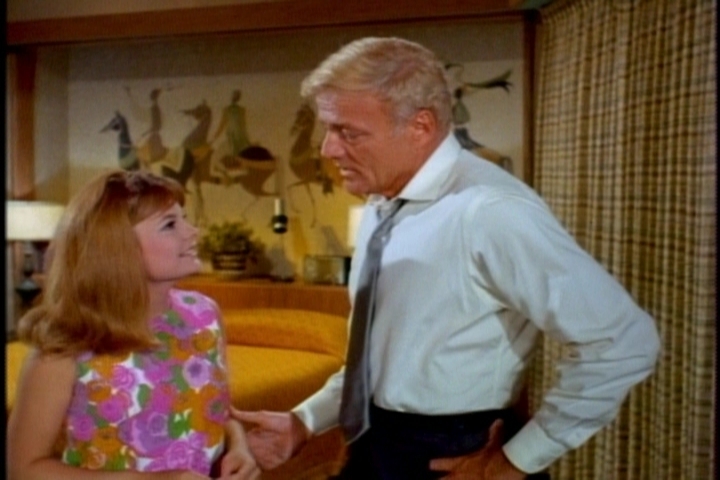 In the bridge party scene, Mrs. Beasley moves under her own power. In the wider shots, she’s perched on the edge of the chair. In the tighter shots, she’s leaning back. Oooh, these clothes, this music, this dance! 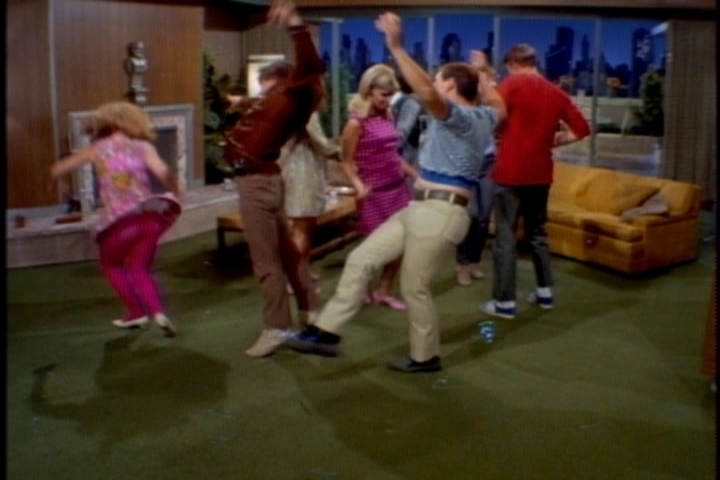 Is that how the makers of the show saw the “Swinging Sixties”? Mrs. Beasley was always creepy. 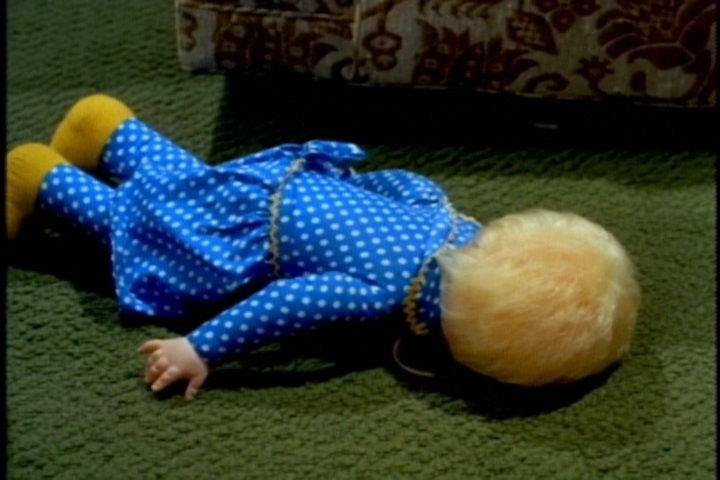 I like how you’ve written this one – when I saw Mrs Beasley there on the floor, discarded, I actually gasped out loud. What will happen to her!! 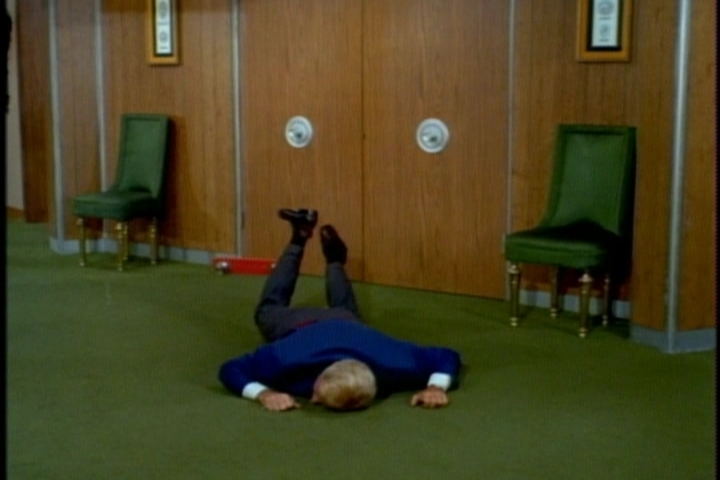 I heaved a sigh of relief when Uncle Bill decided to turf the slob box. 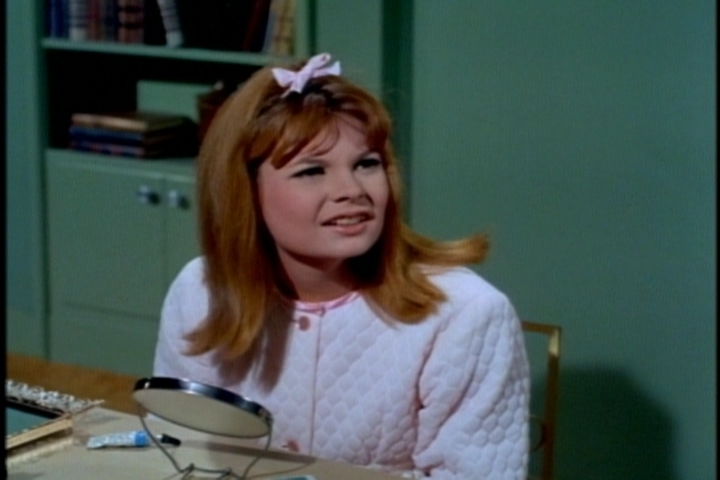 I laughed at the description of Cissy as a Twist ‘n Turn Barbie. So true! That mural on Uncle Bill’s bedroom wall is the same one that my parents neighbours had in their house in the 60’s!!!! How funny! It didn’t occur to me that it was a widely available mural. 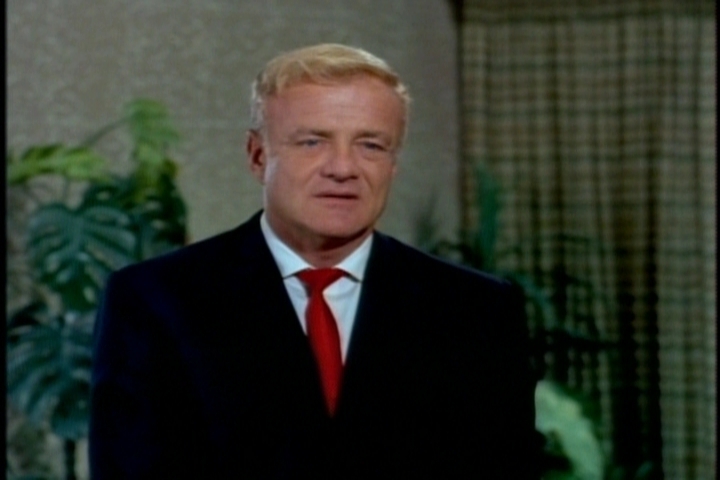 Somehow, it seems especially well suited to a dashing bachelor like Uncle Bill. 🙂 Thanks for commenting! Yes, it is so cool to look back at shows like FA that give a good depiction of the culture and styles….